Kevin Riley, who runs rental company CineStuff with his wife Rita, played a key part in setting up the New Zealand Cinematographer's Society. But his long screen career wasn't a straightforward progression. Unconvinced his longtime interest in photography could be turned into a career, Kevin Riley left school to become an electrician. Increasingly unenthused by the task of crawling under people's houses, he got a job in the early 80s as a sparkie at TVNZ, handling studio maintenance. Sent to help out when a generator broke down on a location shoot, Riley noticed lighting crew standing around drinking coffee while waiting between shots. It was clearly time for a transfer to the lighting department. Soon Riley was "rigging lights on all manner of vehicles, scratching my head over the lighting plan for Hudson and Halls, and hauling miles of cable around Eden Park during the 1981 Springbok test". Riley wasn't in television long, before going freelance as a lighting assistant and generator operator. Next came many gigs working as gaffer (whose job is to sort out the technical complexities of powering and setting up lights). Riley built up experience — and lighting gear — while working with talented cinematographers Leon Narbey, Allen Guilford, and Simon Raby. When it got to the point where Riley had begun to anticipate Narbey's lighting setups, Narbey suggested it was time he step up and start shooting footage himself. In 1993 Riley commanded the camera for the first of a number of shorts: the stylish, offbeat La Vie en Rose. Soon he was was put in charge of second unit photography on Rob Tapert fantasy series Xena: Warrior Princess. The late 90s rushed by in a high speed blur of fight scenes and fantastical kingdoms. On the final season of Tapert's Hercules: The Legendary Journeys, Riley graduated to the key job of director of photography. He did the same for the whole run of spin-off show Young Hercules, and two shortlived Tapert series that followed: Jack of All Trades and Cleopatra 2525. There have been occasional fantasy outings since, most notably shooting alternating episodes of Legend of the Seeker (for which Riley won an Aotearoa Television Award in 2011). But he has also worked on his share of local stories, including combined director of photography and camera operator duties across seasons of Street Legal, Mercy Peak, and later Nothing Trivial. He also found time to shoot American tele-movies The Vector File and Wendy Wu, and rejoined Leon Narbey to aim a second camera at the animatronic whale of Whale Rider, and the epic meal scene that dominates No. 2. In 2005 Riley's lighting company Reel Lights morphed into CineStuff, which rents out a variety of equipment to filmmakers. A few years after that he was attending the 50th anniversary of the Australian Cinematographers Society. Back home, he went door to door — starting with those who had taught him his craft — campaigning for a similar organisation in New Zealand. 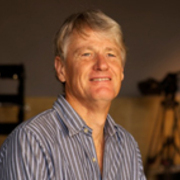 Leon Narbey agreed to become the New Zealand Cinematographer's Society's first president, with Riley as Chairperson, sorting the society's structure. The aim "is to foster the art of cinematogaphy in New Zealand, share the knowledge, and give recognition to our most accomplished cinematographers through our own accreditation system."